I was nominated by Liberate Wings to post one travel photo a day for the next 10 days. Each day I will share a photo and challenge someone else to do the same. I also decided that though pictures say a thousand words… There’s always something more to the photo so enjoy each of the mini- stories of these photos over the next 10 days! This is the story of my time in Quebec City at Le Citadelle. Circa 2008. Between the years of 2008 – 2010 I lived in Toronto, Ontario to study Dental Hygiene. Many great memories were made during these years and this photo brings me back to one of them. Growing up I had an aunt that lived across the country that I would only see maybe once every few years. The Seto family has always been close but I never had the opportunity to spend much time with my Toronto family. During two year stint in Toronto it gave me the chance to see my aunt pretty regularly and spend some much needed quality time together. She and my uncle picked me up from the airport when I first arrived and they did amazing things for me almost weekly. Things like taking me out for dinner, helping me buy groceries, letting me do laundry at their place. Great, and wonderful loving things. One of the things they also did for me, was take me to Quebec. I had visited Quebec once as an air cadet to officiate a biathlon competition but this was the first time I had been back in nearly 10 years. It was so fantastic to be able to see everthing through the eyes of an adult and be able to spend time with my family. My grandmother was also visiting from Calgary at that time so it was extra special to be able to spend time with her in a completely difference place. When I travel I always take the time to visit historical sites, I believe it’s important to understand and learn something about the places you spend time in. The Citadelle still practices traditions such changing of the guard and holds some of the oldest buildings in Canada. It’s actually the largest British fortress in North America. Filled with a labrynth of bunkers and barracks it’s pretty much like a concealed city. If you ever get the chance you must visit this place! And even better if you find thT same pole in my photo and take a selfie I’ll send you a postcard on my next adventure! 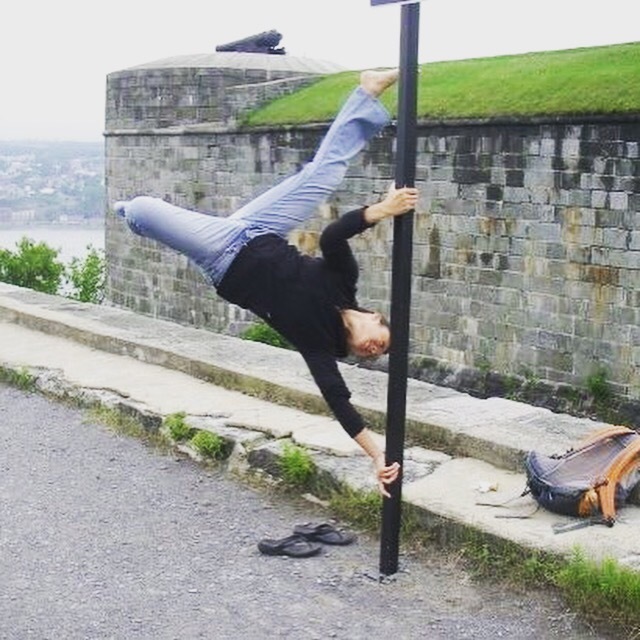 This entry was posted in Adventure stuff and tagged le citadelle, pole dance, Pole Fitness, quebec city, travel challenge by melbaseto. Bookmark the permalink.